LifeBox, the screw box to always have in his quiver! To find in our spare parts tab. New TowMe board! A 4’3’’ board to go big! New biplane for 2019! Thanks to this small wedge adapter, you can convert your Vini to a biplane! You can buy it directly in our spare parts section! New Vini AIR and RIDE officially released! Congratulations to our rider for his senior victory on the Fort Boyard Challenge! Equipped with Horue Vini Pro and Slant 133L (5th scratch). We are proud to unveil the new VINI PRO - The indestructible windfoil / kitefoil ! New outline / new hull / new volume - check it out right now! We are proud to unveil the new range of Femto, the shortest windfoil board in the world! The shape has been reworked and two new volumes have been added : 100 and 115L. I believe I can fly 4th edition, enjoy! New MOISE ! The supfoil by Horue - Light - Carbon made - Made in Europe! Want to run away from crowded spot?? Horue presents the first bungeespecially studied for foil pumping! Take a look at this amazing accessory in our spare parts section! Horue Movie strikes back! Enjoy these amazing edits with the new Noha and Vini ! New ECO ! The affordable windfoil board by Horue! 100% made in Europe, 100% carbon deep tuttle box, fin and foil ready! New foil cover for Horue Vini! 100% made in France by a windfoiler! New Instagram profile to share better and faster with flying riders! Don't hesitate to follow us to see exclusive pics! 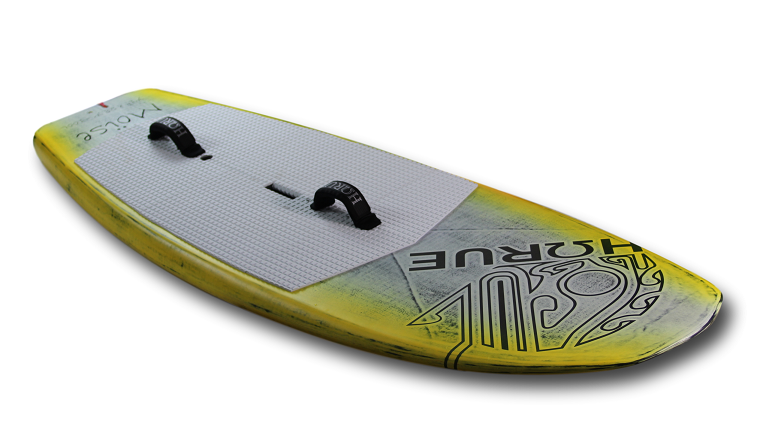 New board on our surf foil range : the Horue NOHA ! The specific foil is coming very soon! Board 100% made in Europe ! Stormy session for Horue's CEO Philippe Caneri in south of France! Overpowered with a 2m² sail, that's another view of windfoiling! The new SLANT has been designed by racers for racers. Its design has been thought to be more efficient with big cambered sail, amazingly large on the rear, the 3 steps decks enhancing the slant of the rider! Full carbon construction - made in Europe ! New board on our kitefoil range : the Horue PRINK ! The first kitefoil board with strap from Horue. Carbon construction made in Europe, very easy to use and deep tuttle box! Horue launches the first sail ever especially done for windfoil ... and fully made in France ! The lighest sail ever with only 2.1kg for this 4.5m² ! The range will start with a 2m² and goes up to 8.5m². Stay tuned for all specs ! The new Caneri Pro Model available now! The lightest kitefoil board on the market! Bastien Escofet showing how the windfoil gear works! A good session with Bastien Escofet and Philippe Caneri with a good wind condition! Edit by Horue Movie Production. Tiny Pro Model - Here we go! The most amazing flight experience ever! 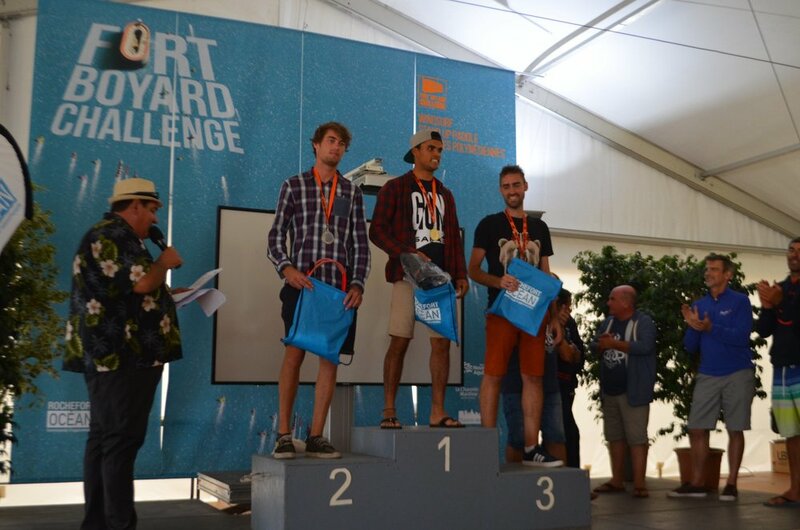 169cm tall with 70L, for sure the shortest windfoil board ever! The Horue Team was on the event "la semaine affoilante" in Saint Pierre Quiberon on april 2016. Philippe Caneri won the 500m speed run with the Tae Prototype (with more than 20kts average speed). Jerome Coquillat, Horue's customer, ended 2nd with the Vini Serial windfoil!